We have been reviewing HyperX memory for nearly 16 years, but today we are looking at our first HyperX memory kit that features RGB lighting. 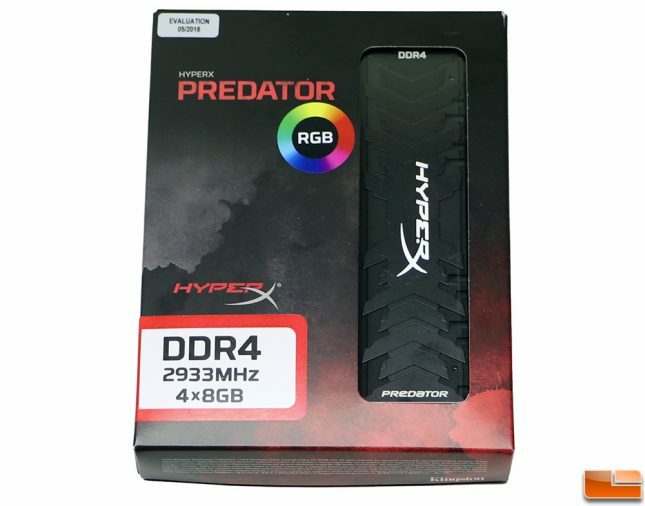 RGB RAM has been around for some time, so HyperX knew they had to bring something innovative to market this late in the game and that is exactly what they have done on the HyperX Predator DDR4 RGB series. HyperX engineers came up with HyperX Infrared Sync technology, which means the LED light bar atop each of these DDR4 memory modules will always stay in sync without any cabling required. HyperX’s patent-pending solution solves the de-synchronization problem seen on other RGB lighting solutions by using infrared signals to keep the modules properly syncronized. Powered directly from the motherboard, the HyperX IR Sync Technology also doesn’t require any HyperX software to be installed. You can just use motherboard lighting control software from motherboard vendors like ASUS Aura Sync, Gigabyte RGB Fusion, MSI Mystic Light Sync, and ASRock Polychrome RGB. HyperX Predator DDR4 RGB memory is available at 2933MHz with CL15 latencies. It’s available individually as 8GB single modules or in kits of consisting of 2 or 4 modules. This means that if you want to run dual-channel you can do so with a 16GB kit and those that are wanting more memory capacity or have a quad-channel board can step up to the 32GB memory kit that has four 8GB modules. With one speed class to pick from all you really need to figure out how much you want to spend. DDR4 pricing is still through the roof, so your budget will likely limit how much RAM you’ll be purchasing. The HyperX Predator DDR4 RGB memory kit that we’ll be reviewing today is the monster 32GB (4 x 8GB) kit that runs $491.99 shipped under part number HX429C15PB3AK4/32. A quick look at Thaiphoon Burner shows that the modules Kingston is using are Single Rank “1R” and use SK Hynix H5AN8G8NMFR-UHC 8Gb DDR4 memory ICs. We’ve seen these DRAM chips uses for at least a couple years by various companies and they have pretty good compatibility. They are speed rated at 2400MHz with 17-17-17 timings, but HyperX binned the chips they purchased from SK Hynix, certified these to be stable at 2933MHz, and backs that with a lifetime warranty. This DDR4 kit runs at 2933MHz (PC4-23400) with CL 15-17-17 timings at 1.35V of power on Intel Extreme Memory Profile 2.0 (Intel XMP 2.0) profile #1 and at 2666MHz with the same timings and voltages on Profile #2. 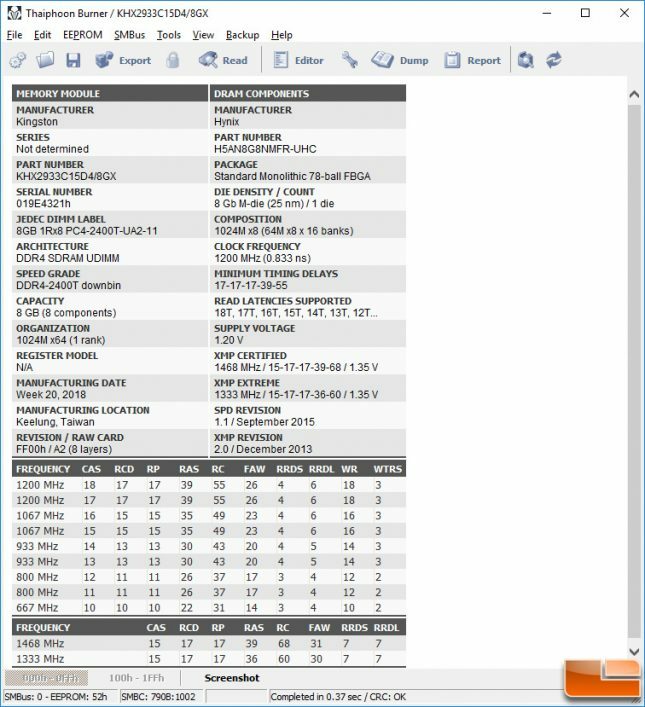 There is a JEDEC profile to ensure the kit posts on most all boards that defaults the kit to 2400MHz with CL 17-17-17 timings at 1.2V. HyperX says that the these Intel XMP-ready and certified profiles are optimized for Intel’s latest chipsets and are compatible with many of AMD’s latest chipsets. We tested it out on a few Intel Z370 boards and AMD X370 and X470 boards and didn’t run into any issues. We picked the ASUS ROG CROSSHAIR VII HERO (WI-FI) to do our full testing on. It has no issues with the D.O.C.P readings on the kit for this board. D.O.C.P. (Direct Over Clock Profile), is what ASUS uses on AMD motherboards so they don’t have to pay royalties to Intel to implement XMP or use the branding. Once you have the memory kit installed and the correct profile selected you’ll be up and running in a matter of seconds. When we selected the 2933MHz memory profile with a CAS Latency of 15, we noticed in Windows that it was showing up with a CAS Latency of 16. 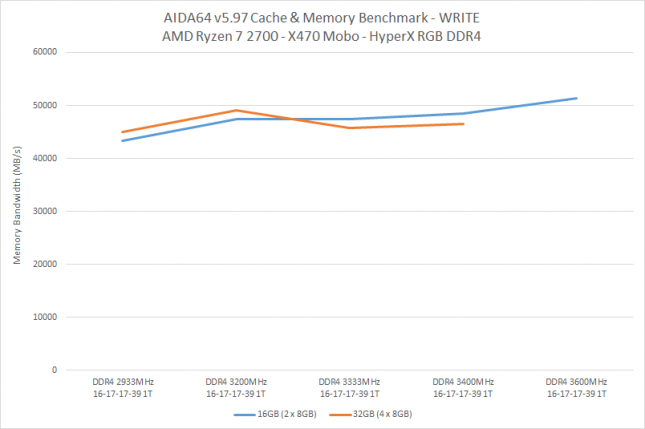 This is expected as we are running an AMD Ryzen platform and on this platform at speeds of 2666MHz or higher the CAS Latency is rounded up to the nearest even higher number. (i.e. CL=15 → 16). Once you have selected the memory timings in the BIOS and confirmed they are running properly you’ll need the software to control the RGB lighting. Since we are using an ASUS board we downloaded the ASUS Aura Sync utility. 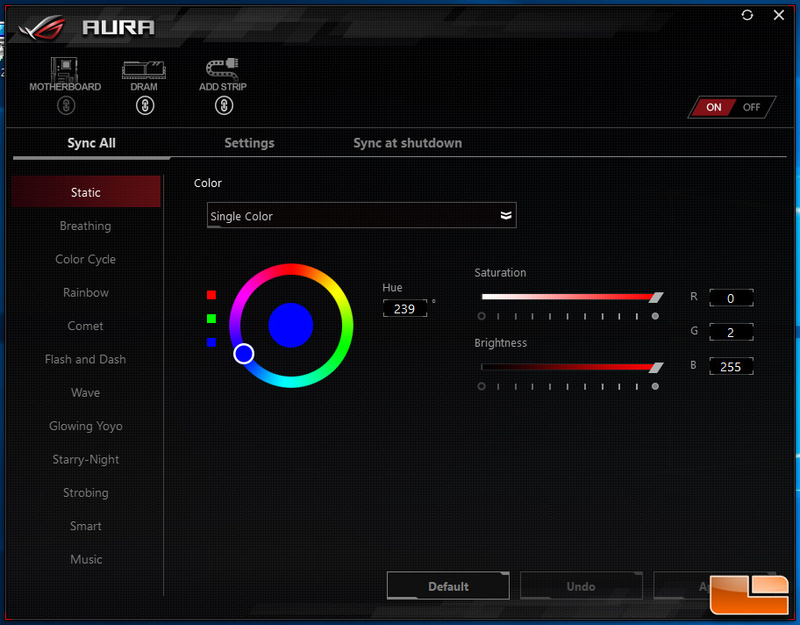 ASUS just added support for the HyperX RGB kits in Aura Sync build version 1.06.29, so you’ll want to make sure you have the latest version downloaded. 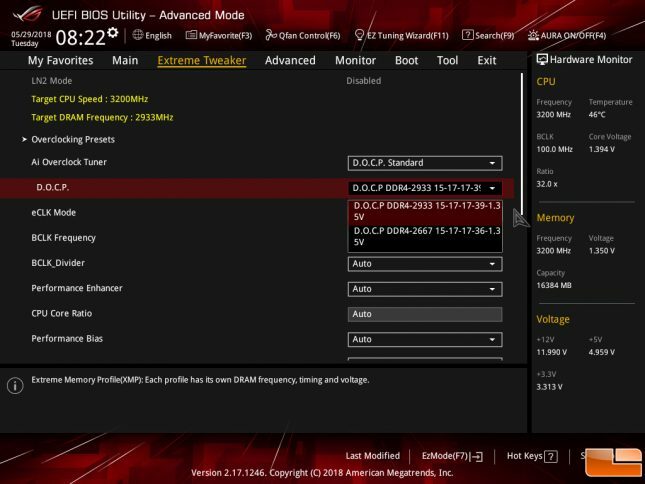 You’ll also want to make sure you have updated to the latest motherboard BIOS/UEFI. The AMD Aura Sync worked fine with the HyperX RGB memory kit. For example if you take a look at the settings above (Static lighting with a blue hue) we get the results below. The motherboard LED, AMD Wraith Prism RGB center fan and HyperX RGB memory kit were all blue. The only ‘glitch’ we had was that on the AMD Wraith Prism RGB CPU cooler is that we weren’t able to change the Ring LED, Fan LED and Logo LED with this utility. We tried using the USB connector and the 4-pin RGB connector without luck. To get full control of the Wraith Prism we needed to download AMD Wraith Prism software. That has nothing to do with the HyperX RGB memory kit though, so no big deal. All the lighting modes on the AMD Aura Sync software worked on the HyperX RGB memory kit just fine. 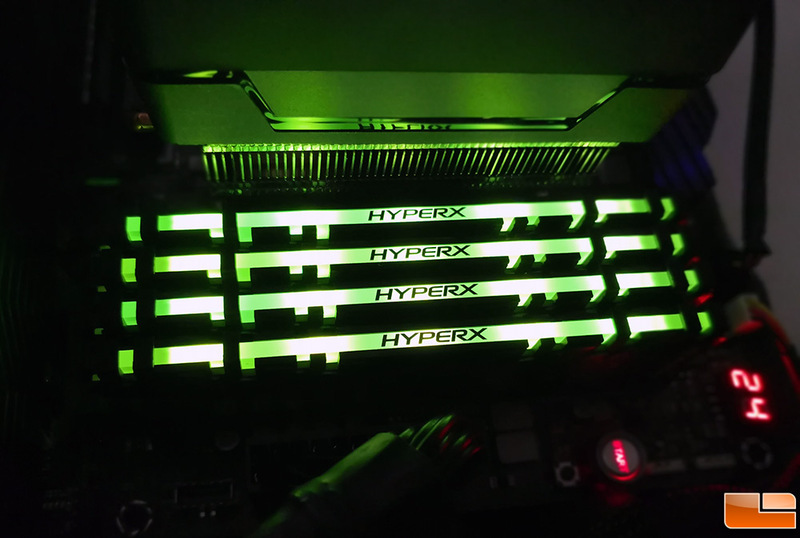 The memory kit looks great and HyperX has a quick video of the kit in action below. We’ve already done memory scaling on our AMD X470 platform, so we’ll be focusing on AIDA64 benchmark results and seeing how far we can push two of these modules and then all four of these modules in our ASUS board. The platform that we’ll be using is the ASUS ROG Crosshair VII Hero (WiFi) motherboard ($255.00 shipped) with the AMD Ryzen 2700 CPU, AMD Wraith Prism CPU Cooler, NVIDIA GeForce GTX 1080 Ti FE graphics cards and a Corsair AX1200i PSU on Windows 10 64-bit. We didn’t know what to expect from the HyperX DDR4 RGB 2933MHz memory kit, but we were quickly impressed. Running two of the single-rank modules 16GB (2 x 8GB) at the 2933MHz stock speeds worked perfectly fine, but overclocking was rather impressive. By changing just the memory frequency in the UEFI we were able to get this 2933MHz kit up to 3600MHz, which is is almost a 23% increase in clock frequency. Memory bandwidth and latency improved as expected with the overclock. When we populated all four memory slots and tested 32GB (4x8GB) we found that the kit would scale up to 3400MHz before encountering stability issues at 3466MHz. Performance with all four slots populated was found to have better read and write speeds up to 3200MH. 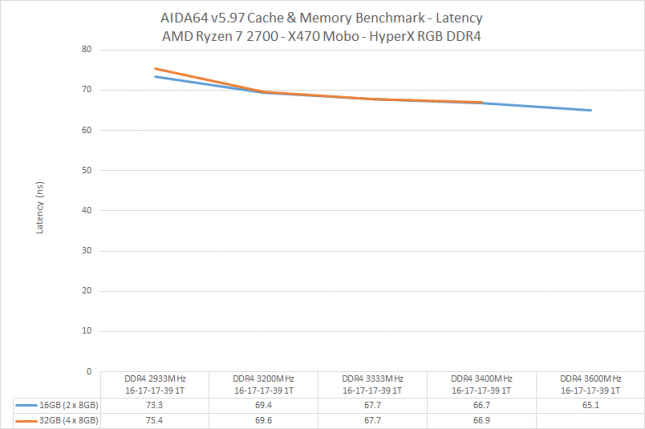 Once over that clock frequency we observed some performance decreases as the advanced memory timings were alerted by the platform automatically. Most people aren’t going to mess with advanced timings, but you can use tools like the Ryzen Timing Checker to see what is going on or use the Ryzen DRAM calculator to figure out recommended settings for this specific memory kit. The HyperX Predator DDR4 RGB memory kit exceeded our expectations when it comes to performance. 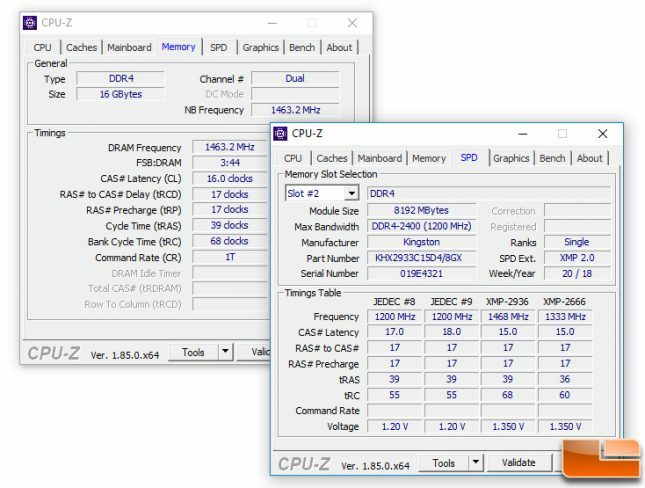 We weren’t expecting this 32GB memory kit to overclock up to 3400MHz on our AMD Ryzen 2700 test platform, but it did and do so with full stability. We actually could get 3466MHz up and running on the desktop, but not with full stability at the stock voltages. With a little more voltage and advanced timing tweaks we are fairly certain that you might be able to run beyond the clock speeds. Every memory kit and platform overclocks differently, so we didn’t see the need to go that deep on this review. When it comes to appearance, the HyperX Predator RGB DDR4 memory kit looks pretty damn good. The black PCB and fierce looking black aluminum heat spreaders look sharp before you top it off with RGB lighting. 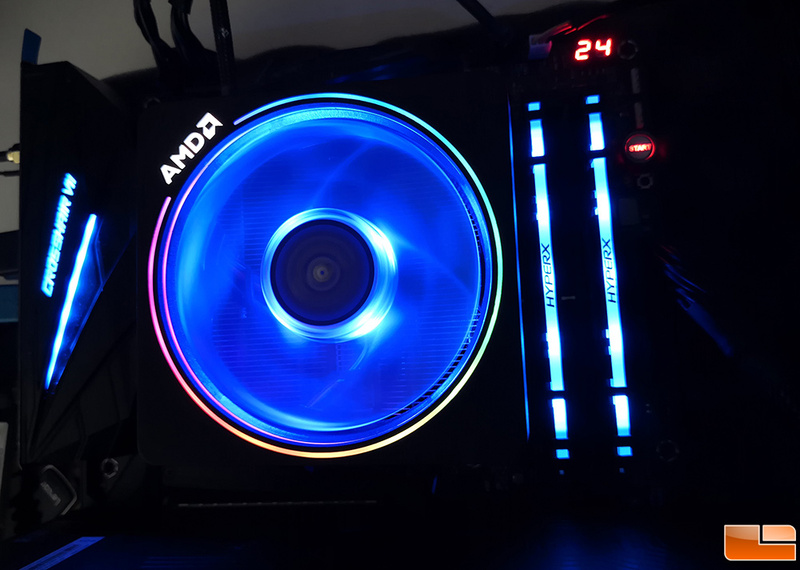 The RGB lighting working perfectly on our AMD X470 based motherboard with the ASUS Aura Sync utility. If RGB is playing a central roll in your next build an RGB DDR4 memory kit makes sense. 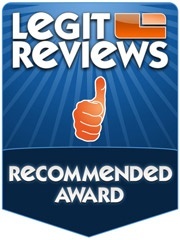 They certainly add some serious eye candy to a system build for those willing to pay a little extra for the feature. The HyperX Predator RGB modules all stayed in-sync with one another, so it looks like the IR technology is doing its job just fine. 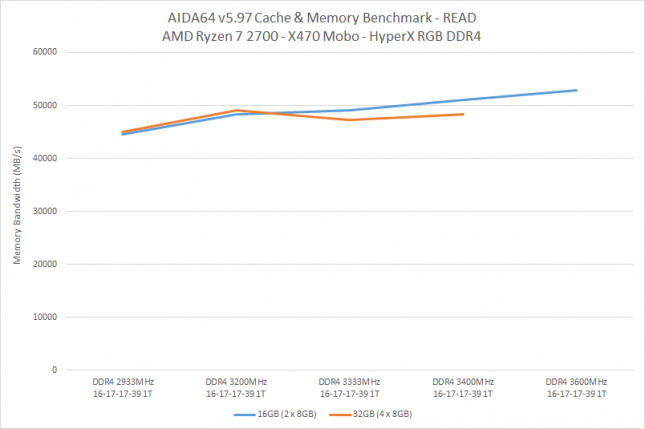 On the pricing front all DDR4 memory modules are sky high right now. HyperX doesn’t off a non-RGB Predator DDR4 memory kit at 2933MHz, but they do offer one at 3000MHz with CL15 timings. 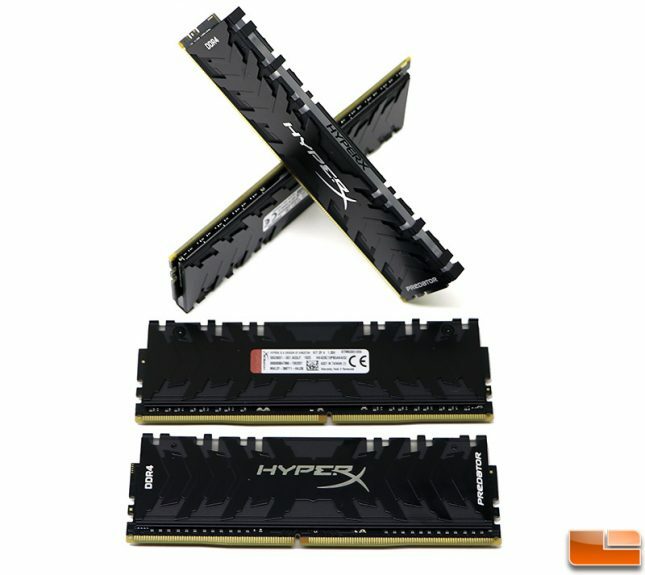 You can get a 16GB (2x8GB) HyperX Predator DDR4 3000MHz memory kit runs $235.04 shipped. For an extra $10 and change you can get RGB lighting and if you are a fan of custom lighting the choice is simple. Legit Bottom Line: HyperX Predator RGB overclocked further than we expected and the RGB lighting looks fantastic.